The information shown below is a text version of the SEO infographic shown above. According to Google their mission is to “organize the world’s information and make it universally accessible and useful”. To achieve this they update their search algorithm over 500 times a year (more than once a day). As a content writer, webmaster or SEO expert it’s impossible to follow every update, however there are key trends in these updates that stand out telling you what you need to do to achieve a high ranking in Google both now and in the future. While the updates may be different, applying the same strategies will also help you with Bing, Yahoo and other search engines. 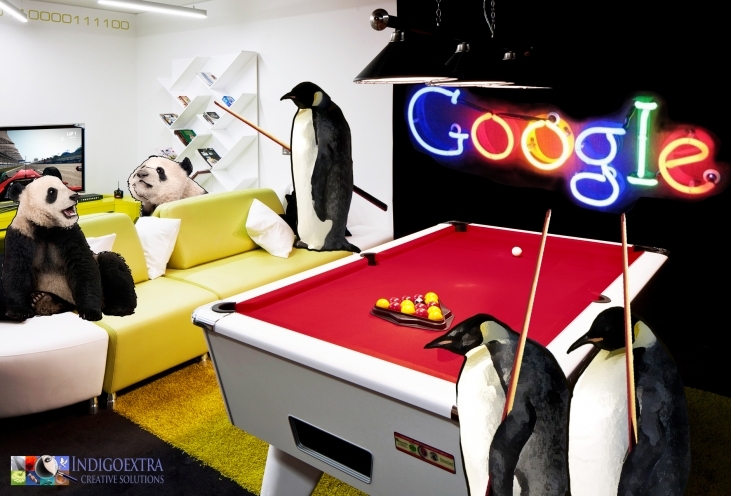 By far the 2 most important algorithm updates are Google Panda and Google Penguin. First introduced in February 2011, with ongoing updates, Panda aims to reduce the position of "low-quality" or "thin" sites. Have an excessive number of adverts. Have very little original or in-depth content. Don’t appear trustworthy (partly calculated based on the number of searches for the brand name vs. the number of times the site’s visited). Don’t show information when you first open the page (i.e. you have to scroll down to see anything useful). Panda is part of a trend of algorithm updates towards valuing high-quality and in-depth content. Have original in-depth content (at least 500 words per page on several pages, over 1,000 words for expert articles). Contain relevant information, not just a sales pitch. Be about a specific topic, not every topic under the sun. First introduced in April 2012, with ongoing updates, Penguin aims to penalise sites that use keyword stuffing or have bad links going to them. Automatically generated links of any kind. Excessive links containing keywords in the anchor text (the clickable part of the link). Excessive links from poor quality directories or generic article sites. Links from irrelevant sites or sites in a different language. Penguin aims to motivate people towards creating quality content that others will spontaneously link to, or building natural links themselves. Unique articles on relevant websites. Infographics or quality image sharing sites. If the link is relevant and would be considered useful by a human visitor, it’s likely to be considered useful by Google too! Certain searches like “Payday Loan” used to generate many spammy results. These updates target specific searches to make the results more helpful. Is your site total spam or highly dodgy? If not, don’t worry about this update! If so, switch to a more ethical business. Since Google Pigeon was introduced in July 2014, results have been more tailored for different people based on their geographical location. Include your address and phone number obviously on your website. Include the same address and number in directories listing your site. Focus on links from the same country as these will give you extra benefit. The Hummingbird algorithm update takes synonyms into accounts and tries to put the search query in context (e.g. “Hummingbird SEO” shows you results about the Google update, “Hummingbird flight” shows you results about how the bird flies. If previously you tried to use every possible synonym (equivalent, likeness, same meaning …) in your text, this is no longer necessary. For optimal SEO include only the most important keywords and only use synonyms if it doesn’t interfere with how well your text reads. The end result of all these Google algorithm updates and expected future ones is that you need quality content and plenty of it, both for your own site and as part of your link building. Building links is a more sophisticated process and is now more like building a network of contacts. It’s therefore best to give it the attention it deserves.